This post is in follow up to my previous blogs on why some operating sites, “just don’t get it.” For those sites that do get it, these are the first steps to setting up an effective PEI Program. Each MS has its own procedures, standards, guidelines, work processes, best practices, engineering evaluations, failure analyses, metrics, etc. that I need in order to outline and operate a successful PEI program. For those who are more visually oriented learners like myself, those 10 PEI MSs are shown schematically in the image below. 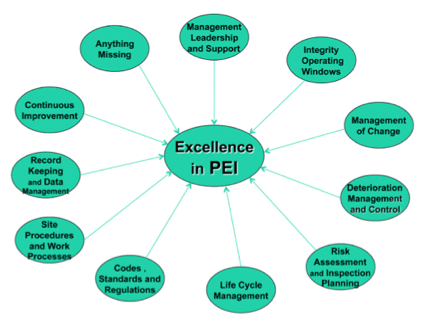 As you can see from the list of 10 PEI MSs above and in the image above, there is much more to a robust PEI program than just inspection procedures and standards. PEI is not just the result of a competent inspection program! It takes an effective multi-disciplined approach with management, operations, engineering, maintenance and inspection to accomplish what needs to be done to achieve excellence in PEI. All of these PEI MS need to be highly integrated in order to achieve success in PEI. Hence, if I were to draw figure 1 more accurately, there would be a double-ended arrow from each MS bubble to every other MS bubble on the diagram; but that would be too messy and the effect of the illustration would be lost; so you will just need to be aware that all those other arrows exist, even though they are not shown. 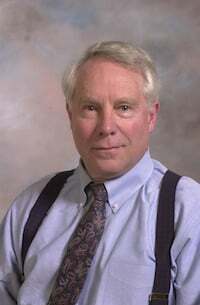 Those operating sites, which still have each of their functions mostly “working in silos” and not effectively integrated with the other disciplines, will not be able to achieve the level of PEI success that is vital in today’s competitive environment that demands the utmost in cost containment and reliability. Like all 10 of the MSs, if you don’t have all the systems in place for management leadership and support for the PEI program, you are not likely to achieve the level of success needed. So this is a critical PEI MS, just like the other 9. In the best case when this MS is fully functional, the PEI group is following strong management leadership and support for the PEI mission and objectives, and as such, is “hanging onto the PEI rope on which management is pulling”. In the worst case, where management leadership and support is lacking, the PEI group spends a lot of time “pushing on the PEI rope”, and we all know what usually happens when we push on a rope. This MS, management leadership and support for the PEI program, describes the systems and work processes that are needed from operating site and company management in order to provide the leadership and resources necessary to achieve excellence in PEI. Those resources include budgeting, staffing, training, certification, competency improvement, an attitude of shared stewardship of assets, PEI knowledge transfer to others who need to know, and management “walking the talk”. The Management Leadership and Support MS will also detail how it is connected to the other 9 PEI MS, especially the following IOW and MOC MS.
A comprehensive IOW program is another MS that is critical for success of the PEI program, without which PEI failures and their consequences are probably going to continue, no matter how good the rest of your PEI program is. It takes solid teamwork between operations, process engineers and corrosion engineers, among others to establish and maintain an effective IOW program that will help to avoid PEI incidents. In the IOW MS, there are systems and procedures that describe how IOW’s are created and implemented, including how operators and others are to respond (corrective actions) to IOW alarms and variances (as well as how quickly they need to respond). Additionally, the system will include how changes are to be made to IOW’s once they are approved and implemented in the field. Further, the system will describe what process monitoring techniques and process sampling will be needed to provide assurance that the process stays within the established IOW limits. An item worthy of note is that the API, recognizing the vital role of IOW’s in achieving success in the PEI MS, has just recently approved the creation of a standard on how to go about creating and implementing IOW’s. As is the case with all other PEI MS, when I write about this MS, I will detail how it is connected to the other 9 PEI MSs, especially the Deterioration Management and Control MS.
Next week I will continue my high-level overview of the PEI MSs. Sign up for the Inspectioneering Turnaround to receive notifications of new blog posts as well as industry news, events, and Inspectioneering Journal content.